This is the recent felt painting that I’ve been working on. It’s probably the most complex painting I’ve done, although it doesn’t look like it when the wet felting is done. 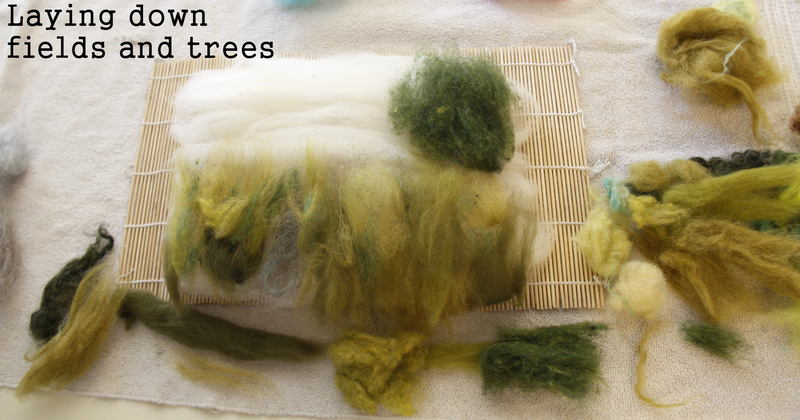 The wet felting is only to get my base layer down, and then I add more layers and details with needle felting, also called dry felting. 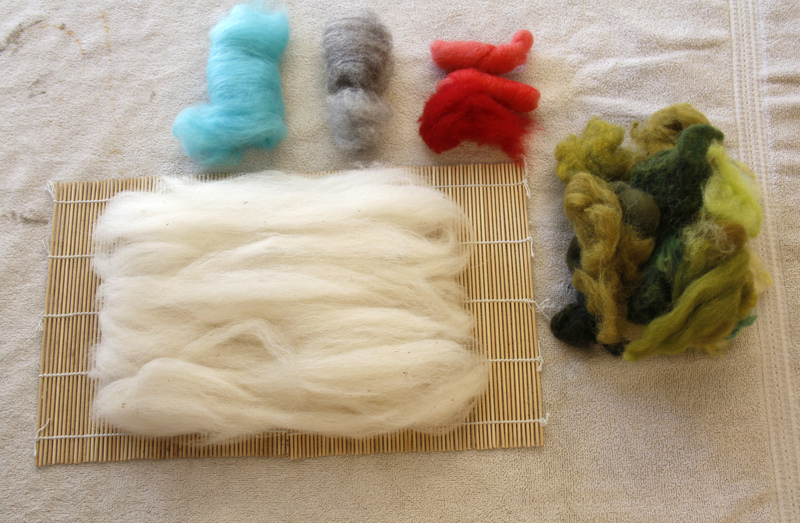 This is Part 1 of the felting process, and when I finish the needle felting I’ll show that process in Part 2!! Bamboo mats. Sushi mats or a bamboo window shades can work! Plastic netting. 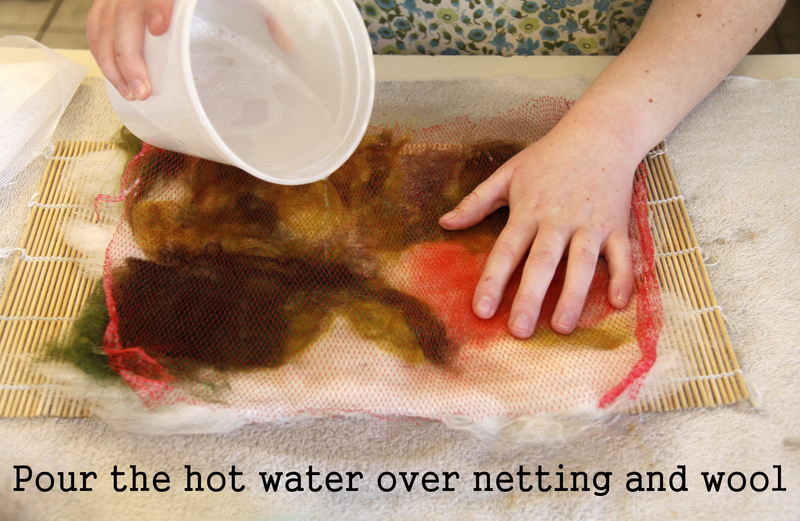 I used a plastic netted onion bag, or you can buy large sheets of dense mesh from felting supply companies. Very hot water and liquid soap. Here’s the photo I’m working from! It’s a great photo. 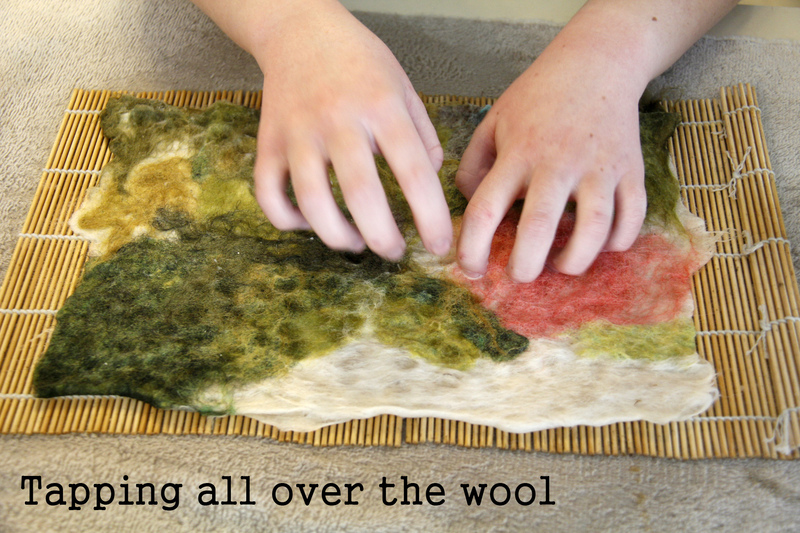 Now spread the white wool in vertical, than horizontal layers on the bamboo mats. This is your canvas, so make it the size you would like. It’s okay if it gets thick, as it will settle down as you felt it. Now for the fun part! Start laying down (painting) the basic colors on your white background. Use variation in your colors, because that adds depth to the piece. The layers by now are about 1 1/2 to 2 inches thick, but don’t worry, they will felt down! Pour the very hot soapy water over the piece. Gently tap, press, poke and generally agitate the wool with your fingers all over the painting. The hot water “opens” the fibers, and agitating the piece locks the fibers together and makes it felt. 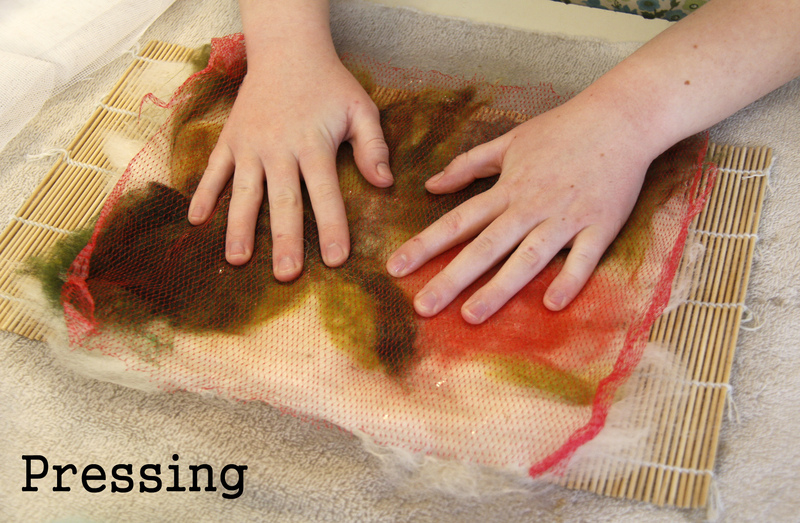 Cold water “closes” the fibers, so you’ll rinse the piece in cold water when you are done felting. If you need more soap, you can put some on your netting so it will foam all over the piece. 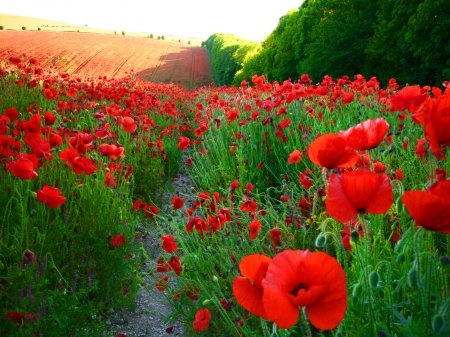 The more it felts, the harder you can agitate it. You can be pretty rough with pressing, but be a lot more gentle with rubbing, because rubbing can move pieces out of place. Let it dry on a towel, and prepare for Part 2! 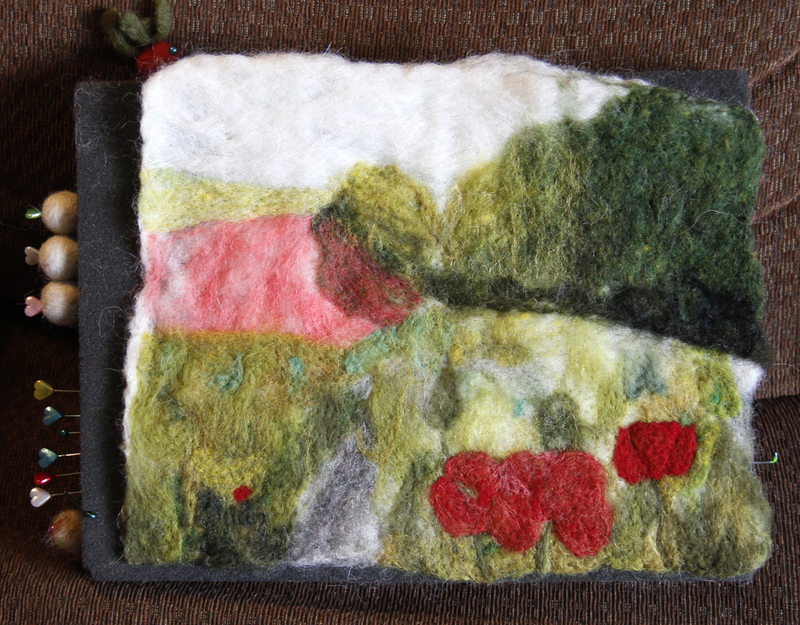 Here’s what it looks like with the big foreground poppies partially needle felted on. There’s more to come! 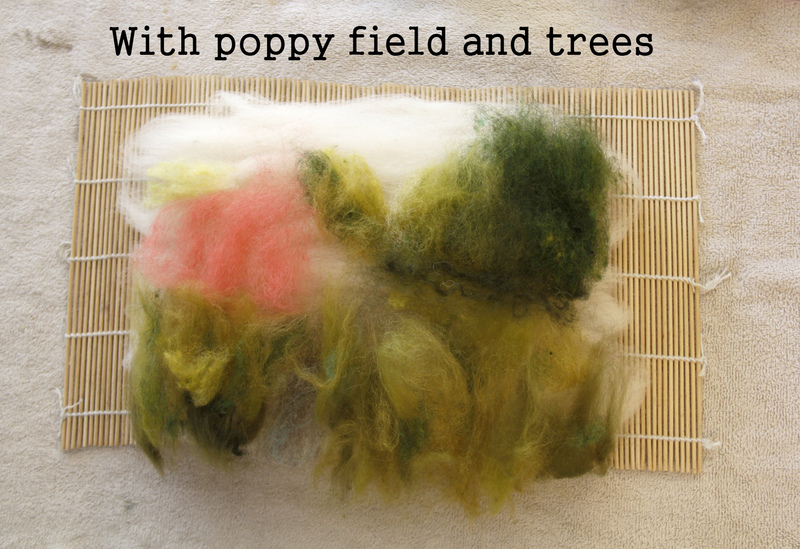 I obviously still have to felt all the poppies in the field and add color to the sky, because I didn’t do it during the wet felting.